Out’n About! 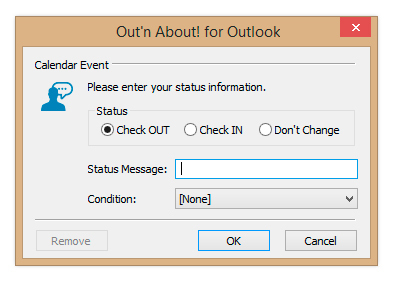 for Outlook allows you to schedule future status events (e.g., meetings, travel, or vacation) based on Outlook Appointment items. When you open an existing appointment or create a new appointment, click on the Out’n About! Calendar Event toolbar button to configure a future status change. When the appointment occurs, Out’n About! will automatically change your status based on the settings you define. You can also have the Calendar Event check to see if you are currently Checked In or Out and only set the new status if the condition is met. This is useful when you are out of the office (e.g., sick, meeting, or travel) and you do not want the Out’n About! software to check you In for a meeting, etc.